When you are purchasing a piece of equipment, you obtain competitive quotes, verify specifications and generate a purchase order. For that matter, just about anything we purchase goes through the same process. However, there is much more to purchasing forklifts and other material handling equipment. We have found, over the years, that often there are variables that can greatly affect the total cost of ownership of anything, be it an automobile, forklift or a giant cargo container. Useful Life – Finally, how many hours can you expect from each piece of equipment until the cost to operate becomes cost-prohibitive? This can vary widely depending upon brand and model. But having some qualitative and quantitative information on hand, if possible, will help you make a better decision about the total cost of operating each unit/model. Our flagship line, Linde forklifts are widely considered the world's most cost-effective and productive forklifts. 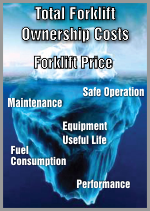 Their engineering and construction make them the lowest total ownership cost forklift available! There are many factors beyond price tag or lease rate that can help you make good decisions about the equipment you purchase. Having a partner that listens, evaluates and fulfills your needs is essential in building a fleet that is most productive and less costly in the long run. Contact us at 410-344-1801 to speak to one of our material handling professionals about the right forklift for your operation.